Momentum is on her side right now. 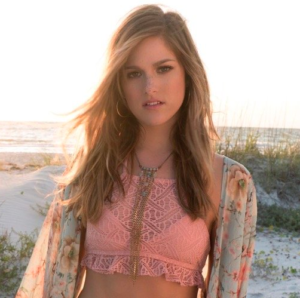 Cassadee Pope has some good momentum right now. She’s coming off a #1 hit with Chris Young. That song seems to have propelled her even more into the country mainstream. She had a top ten of her own a few years ago and now she’s looking to continue with this new momentum. This single is part of an EP that she just released as we head into the summer months. So this one is definitely coming out at the right time. The theme is summer and specifically summer love and how something about those warm summer months can make two people fall in love. But it also seems that the love can be short lived. Things happen and then each person kind of goes their separate ways. Maybe they talk about staying in touch, but usually things just kind of drift. This is a good song. It’s catchy. There’s a story to tell. You can kind of feel the heat from the sun in the lyrics and in the melody. You can imagine the passion these two shared as they got to know each other during their summer together. It didn’t work out in the long run, but they were living in the moment and enjoying the time they had. I think this one could crack into the top ten later this summer. Maybe right around the time September comes along. Where do you think this one will end up?